Emoji Phrase is the latest game from the makers of the original emoji-based game, Emoji Pop Quiz. The object of the game is to solve puzzles with common phrases, quotes, song lyrics and more. The clues will have a mixture of words and emojis, along with a hidden word. Use the letters provided to solve for the hidden word to solve the level. 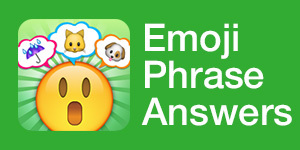 If you get stuck, Emoji Phrase Answers is here to help. We have the cheats for every single level of the game and add new levels as soon as they are released by the developer. Emoji Phrase Answers | Emoji Phrase Cheats This site is not endorsed by or affiliated with Six Waves Inc.